Here is some information about the latest issue: the table of contents can be seen below. This magazine costs $7 + shipping or can be read as a .pdf online for free. It is printed every two months, so the next one will be released March 1st, 2018. Deadline for ads or stories is February 25th, 2018. 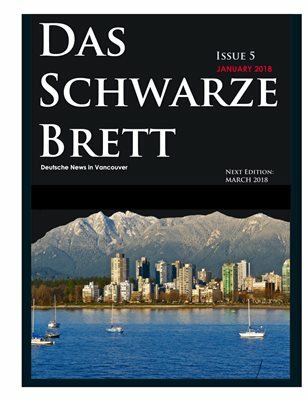 Das Schwarze Brett shares German, Swiss & Austrian news in English for Canadians in Vancouver, BC and the entire west coast. I promised them all a mention in a blog post and here they are. 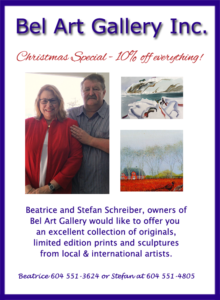 First of all, I would like to thank my first two advertisers, which are Hannelore Nolte with Nolte Log Homes Ltd. and Beatrice Schreiber with the Bel Art Gallery Inc.
Bel Art Gallery Inc. would like to welcome you to the World of Fine Arts. Available for you is an excellent collection of originals, limited edition prints and sculptures from fine local and internationally acclaimed artists. currently being displayed at Pagnanini Lam 3701 Hastings Street, Burnaby, Canada Export Centre, 602 West Hastings Street, Vancouver. Since its formation, PMA has become Canada’s leading Wine & Spirits Agency. We attribute this success to our supplier partnerships and dedicated team who are able to adapt to this rapidly changing industry to build brands for the long term. 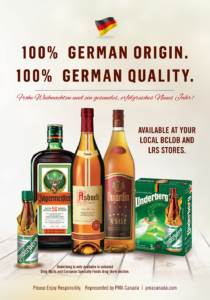 Some of the world’s premium spirits and wine brands we represent include Grant’s Whiskey, Glenfiddich Single Malt Scotch, Gibson’s Finest Canadian Whiskey, Two Oceans Wines, Amurula Cream Liquer, Jägermeister, Disaronno & Underberg. 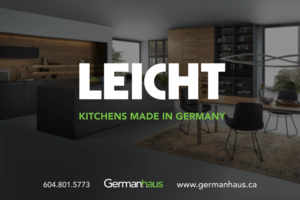 Germanhaus is an authorized dealer of LEICHT Küchen AG, quoted by market research institute GfK as the “Best sold premium brand in Germany” in 2015. The same year it was the only manufacturer of European kitchens that won the award “the most innovative brand of the year”. LEICHT was founded by the two brothers, Alois and Josef Leicht in 1928. Luckily LEICHT means EASY in German. LEICHT allows our customers to choose from more door finishes and styles, cabinet hardware, LED lighting options, and inserts than any other European manufacturer. Here are some Canadians, where Dawna Mueller with Dawna Mueller Photography was the talent behind the front cover. Kendyra Corttni, who is a passionate vegan and loves travelling to Germany, is now offering consulting services to Canadians who want to explore a new nutritional lifestyle. 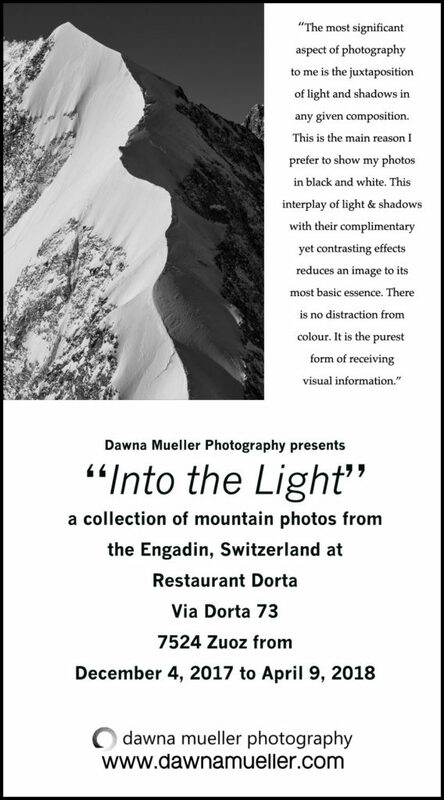 I am a Canadian living in Switzerland who is passionate about nature, mountains and adventure. I grew up in Burnaby, BC, but as a young adult I spent every summer for over a decade in the Yukon, which is wild and raw, and amazing for the visual senses. This experience in the pristine nature left an indelible impression in my mind. An impression of nature, mountains and rovers relatively uninhabited except for the wild animals who roam them. But mostly this left an imprint in my heart and it is where I now feel most at home; in the mountains and in nature. Photography has been my hobby since I had my first camera as an adolescent. My earliest memories were experimenting with my mother’s Brownie Box Camera when I was a child. At this point in my life, I have taken my passion for photography, combined with my love of nature and the outdoors and turned it into a full time exciting adventure. As of June 2016, I have finished a one year professional photography studies program with CAP Fotoschule in Zurich. I am excited to see what the future holds. I am thrilled to share my visions and work and hope you enjoy them as much as I did making them. All of my images are available for purchase. A healthy vegan diet is comprised of 100% plant based, mostly non-processed foods, that can make people and cats thrive. 20% of your fee is donated to an animal charity. Sometimes people contact me out of the blue. One of them is Erwin Baumgartner from Switzerland who loves to travel to BC & Alberta and George Hartmetz from Kelowna who is looking for a companion who knows how to cook. Do you speak 4 languages and like to travel? Then you may want to contact this man who is organizing travel adventures for Europeans in Canada. 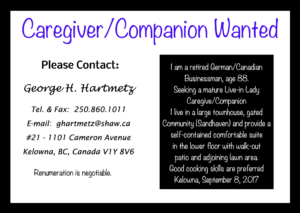 Finally, last, but not least, if you have ever wanted to move to Kelowna and you love to cook, here is your chance for a fresh start in a beautiful city in BC. George is looking for someone to live in and who will spend time as a companion. 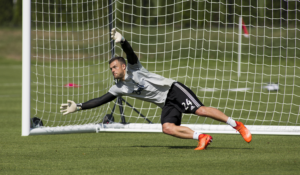 The Whitecaps were not advertisers, but they did let me interview their new goalkeeper Stefan Marinovic who played in Germany for a number of years and was originally from New Zealand. Read all about him in “Das Schwarze Brett”, found on www.magcloud.com (type Das Schwarze Brett” into the search bar). The season came to a close for Vancouver Whitecaps FC on Thursday evening, as they suffered a 2-0 defeat at the hands of the defending MLS Cup champion Seattle Sounders FC. (read the full article by Piccolo Ocampo here) Photo credit to Bob Frid/Vancouver Whitecaps FC. My Father was born in Friedberg Germany in 1934, and he moved to Kanada in 1960 where he met my mother, a Native woman from the Bear clan, Ojibway Nation, i was born April 20th, 1966 in Sault Ste. Marie, Ontario. My beating German heart coupled with my first Nation’s skin colour has been somewhat of an anomaly for me; I always felt i was too brown for Germany and too German for First Nations as per my work ethic and driven nature. Learning to combine both cultures inside me has been a life long journey. Coupled with a series of learning experiences, i have always embraced my German Culture, but it has only been the last 6 years that development of both cultures existing together has been a formula for moving forward. As a result I returned to Schooling at a Nature College, got elected Chief of Student council, formed a basketball and foods program. 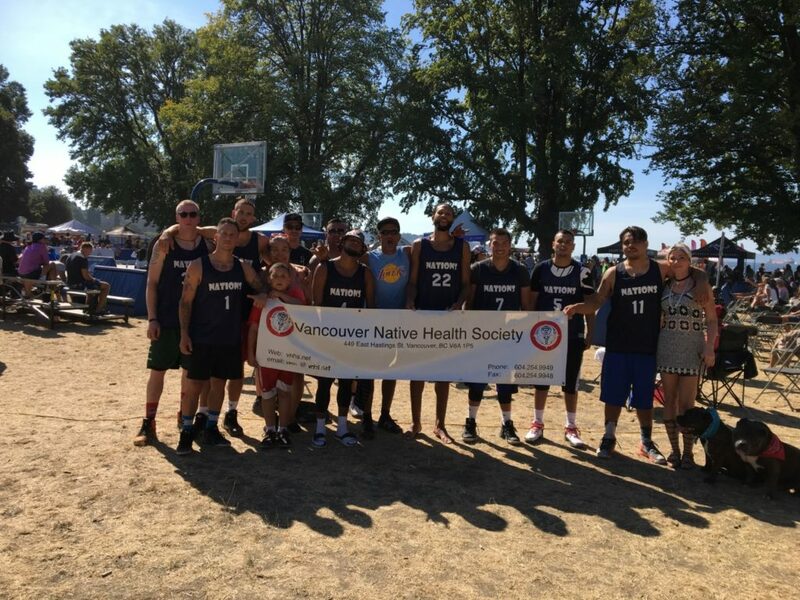 After college I kept the basketball program going and started a non-profit society called Nations Warriors Wellness Society right here in Vancouver, utilizing the strengths of both cultures to co-exist together. Citing both the German and Native Nations are tribal by nature and can work together in harmony to create magnificent opportunities in the community.